Calgary Flames' Johnny Gaudreau celebrates a goal during a game against the Edmonton Oilers, in Edmonton, on Jan. 19, 2019. A propellant in the Calgary Flames’ surge to the top of the NHL’s Western Conference is a power play with pop. Calgary’s man advantage was not a strength last season, when the Flames finished tied for third-last in the NHL in that department. It took a few weeks for Calgary’s power play to build steam under new coaches this season, but the Flames have scored a league-leading 12 goals with a man advantage so far in January. Top-line centre Sean Monahan had potted three this month, with Johnny Gaudreau, Elias Lindholm and Sam Bennett contributing two apiece. With 42 goals from Calgary’s power-play units in 50 games this season, the Flames are one away from matching their entire 2017-18 output. 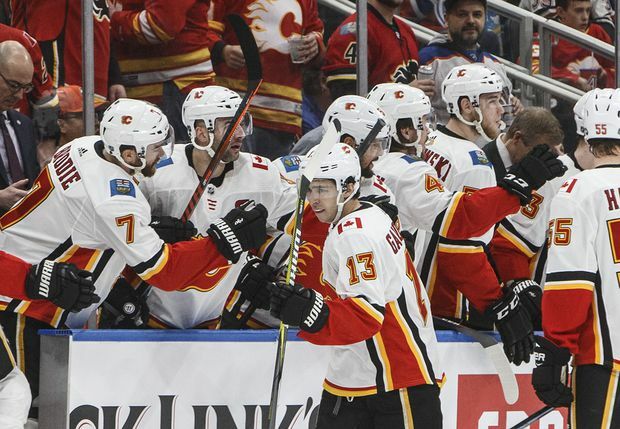 “In the last month, both units have provided offence and scored, so that’s been a big boost for us, and they’ve been timely goals, also,” Flames head coach Bill Peters said. Peters, in his first season behind Calgary’s bench, assigned power-play management to assistant Geoff Ward, who also arrived last summer from the New Jersey Devils. Calgary’s power play ranked 13th in the NHL on Jan. 1 with a 21.1-per-cent success rate. The Flames have since elevated that to 24.1 per cent, good for eighth in the league. Monahan leads Calgary in power-play goals with 11, which puts him in a three-way tie for second in the NHL behind Boston’s David Pastrnak and Tampa Bay’s Brayden Point (13). Gaudreau tops the Flames in power-play points with 22. The Flames have averaged just less than 3.5 power-play chances a game this season compared with 3.2 last season. “I think this year, we’re allowing ourselves to be on the power play more,” Monahan said. “We’re moving our feet more, which gives us more time on the power play by drawing penalties. “When you’re drawing penalties and you’re getting yourself on the power play, you’ve got to get momentum from that. When you’re out there that much on special teams, you’ve got to make something happen. The Flames (32-13-5) are at home Tuesday to the Hurricanes (23-20-5) before the all-star break, which combined with a bye, gives Calgary an eight-day hiatus. Peters, who coached Carolina for four seasons before his arrival in Calgary, will face his former club for the first time. It’s also the first game between the two clubs since Flames general manager Brad Treliving sent defenceman Dougie Hamilton, forward Michael Ferland and prospect Adam Fox to Raleigh to get Lindholm and defenceman Noah Hanifin in June. After musing to reporters after Monday’s practice that he would probably go say hello to the Hurricanes he knew, Peters didn’t have to wait long to make contact. Rod Brind’Amour, who was promoted from assistant to head coach after Peters’s departure, waded through media to shake the Calgary’s coach’s hand. After Carolina’s 4-1 loss to the Ottawa Senators on Saturday, Brind’Amour threatened to come off the bench and out of retirement to play, which was a source of hilarity between he and Peters. The former Hurricanes’ captain retired in 2010 after a 20-year career. “We watched some video today in case Roddy comes in and takes some faceoffs,” Peters quipped.